Vast amounts of natural gas produced from the hydrocarbon extraction process are stored in large sub-surface units known as Underground Gas Storages (UGS). Natural gas storage in UGSs serve as critical reserves accumulated during periods of low demand (e.g. in the summer) and are withdrawn during winter when natural gas is used for heating purposes. Critical reserves are also used to address unstable demand and for market speculation. Natural gas is stored at about 68 – 95F (20 – 35°C) and allowable gas pressure of 2300 PSI (20MPa). A major downside to natural gas storage in UGSs is that it becomes saturated with water vapor, i.e. becomes a wet gas under UGS pressure and temperature conditions. Thus, utility companies need to dehydrate the gas before sending it to supply lines. In the U.S., the water content limit for natural gas stored in a UGS is 4 – 7 lb/MMscf. The temperature at which natural gas becomes saturated with water vapor is known as the Dew Point Temperature (Tdew). Natural gas dehydration is the process of removing associated water from natural gas molecules either by absorption or adsorption. Absorption uses a dehydrating agent to remove water vapor from natural gas while adsorption condenses water vapor out of the gas. Glycol dehydration is one of the most common and economical processes for reducing water content in natural gas and natural gas liquids (NGLs). According to the EPA, there are about 3500 operational TEG units in the U.S. alone. The process utilizes Triethylene Glycol (TEG), a highly viscous liquid that is colorless, odorless, and stable at room temperature to desiccate natural gas. 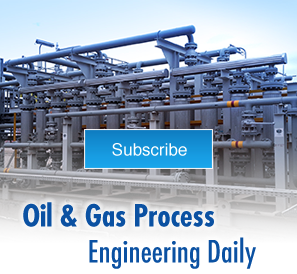 TEG is an excellent absorbent for dehydration of natural gas due to its hygroscopic nature. How does TEG gas dehydration work? TEG dehydration is carried out in a dehydration unit for natural gas called a TEG unit. 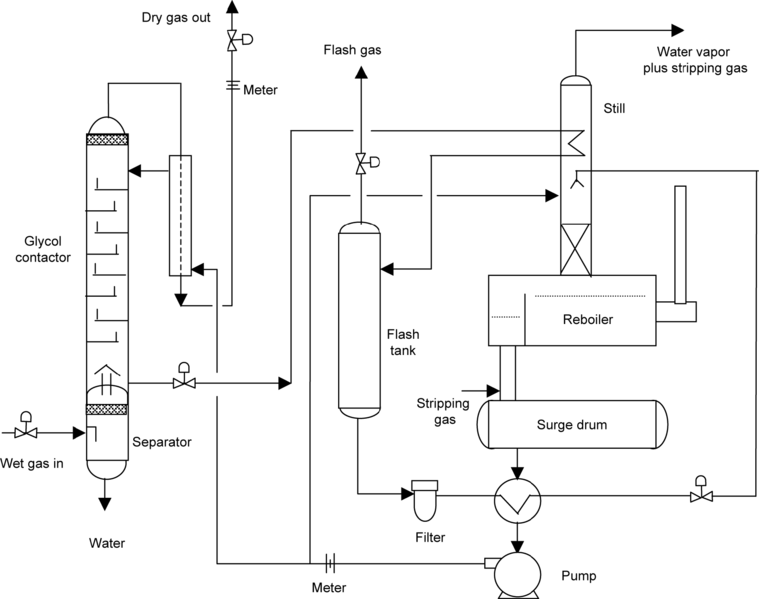 The dehydration process is quite straightforward; wet gas enters the unit from the inlet at the bottom of the separator and passes through the glycol contactor. Glycol flows into the contactor tower from the top of the separator unit. A special bubble cap inside the unit maximizes wet gas – glycol contact for maximum dehydration. TEG dehydration can reduce natural gas water saturation to less than 5lbm/MMScf. The dehydrated gas is collected from the top of the unit and channeled to supply pipelines or advanced processing units while the water-rich glycol is sent to the re-purification unit to recover pure glycol. Membrane dehydration is an alternative method for natural gas desiccation which utilizes a hollow-fiber membrane for water vapor removal. It is a cost-effective and durable process for natural gas dew point control as well as H2O, CO2, and H2S removal. How does Membrane dehydration work? In membrane dehydration, a gas compressor is used to pump wet gas through a hollow-fiber membrane which separates the low-permeability dry gas component from the high-permeability water molecules. Membrane systems are preferred due to their high durability and efficiency and compliance with stringent emission regulations. Dehydration of natural gas using absorbents is a low-cost technique for ensuring dry gas supply. Solid adsorbents are hygroscopic in nature (exhibit a strong affinity for water). Common adsorbents used for natural gas desiccation include silica gel, molecular sieves, and alumina. How do adsorbents remove water vapor from natural gas? Silica gel (SiO2) is a porous hygroscopic solid at room temperature which can be used to absorb moisture from natural gas. Silica is commonly manufactured as small beads and placed in a desiccant unit to dry the gas. Alumina or Aluminium oxide (Al2O3) is a porous, crystalline solid derived from bauxite with strong hygroscopic properties. Alumina is an excellent adsorbent for dehydrating natural gas. We can also use a molecular sieve for dehydration of natural gas. Molecular sieves are commonly manufactured as solids compounds of a few millimeters thickness and width. They are especially useful for dehydrating sour natural gas containing multiple aromatic compounds. Integrated Flow Solutions (IFS) designs and manufactures skid mounted process equipment for the O&G, Power Generation, and Air Quality industries. We supply a range of ISO and ASME-certified membrane systems for natural gas heavy hydrocarbon/dew point control as well as H2O, CO2, and H2S removal. Our Fuel Gas Conditioning Skid utilizes the most efficient membranes in the industry, suitable for removal of water, H2S, etc. Contact us today to learn how IFS can help with your gas processing needs.